Editor’s Note: Over the coming weeks we will periodically publish various keynote addresses and presentations by our speakers and panelists at the 2018 SMA Summer School. Last Friday we published the keynote address by Cardinal Nichols of Westminster. Today we publish the comments made by the Rev. 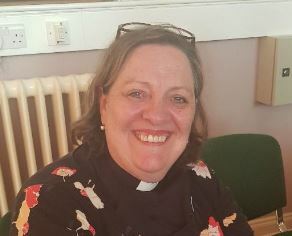 Elaine Murray, a Church of Ireland priest serving in Carrigaline, Cork. Elaine’s remarks were delivered as her opening statement for the ecumenical dialogue which began this year’s Summer School. We will intersperse the addresses and comments with ongoing developments in Africa, as there are several critical issues we need to monitor including the ongoing crisis in northern Nigeria between Christians and Fulani herdsmen. We hope all of our readers who were not able to participate in the Summer School will find the various presentations enlightening and helpful. I am the Rector of a medium sized Church of Ireland Parish in the diocese of Cork. An Inclusive & Welcoming Parish, and an Eco congregation, participating in many Interfaith initiatives through the Cork Three Faith Forum , which incidentially is where I met Gerry Forde, the Justice Officer with SMA in Cork.. who is responsible for me being here today!. I have been ordained a pries exactly 12 years today, 29th June, St Peter’s day and I have been the Rector (Parish Priest) in Carrigaline for 6 ½ years, and before that I was in Kilkenny, a Curate for 3 years and a Vicar for 4 years. Its complicated! I know I spent most of my time in theological college telling my family that it was only in England that priests were called vicars and then I ended up as a vicar in St Canice’s Cathedral! The inevitable comparison with the Vicar of Dibley! When I was asked by Gerry to be part of this panel, I almost immediately said yes (once I checked my diary) because , a little like Molly Bloom in Joyce’s Ulysses, I am perhaps overly fond of saying yes. When I was in the Theological College I made a promise to myself that, when I was ordained, I would always try to say yes to any request made of me, especially if it frightened me – so when I am asked to do a press interview, or go on the local radio, or do a sponspored diet for the local youth club , or do a 4:30am service in the woods for the Dawn Chorus…. I say yes. I say yes, and then I panic a little. But I promised myself I would be there, in the thick of it, I never wanted to be the kind of priest who would hide way behind my theological tomes and only make an appearance at the Sunday Service to give forth of my wisdom… and if you ever heard me preach you’d realise that that plan would never have worked out anyway! I never thought that this personal policy had a kind of a name but when I finally started to think about what I wanted to say in my given ‘slot’ today I realised that it did actually have a name….. I realised that somewhere along the line I had answered a call to a ministry of ‘presence’…. just being there for others is, I have come to believe, radical discipleship in a wounded world. I have lived in many places over my almost 60 years. My parents died when I was 11/12 and I left school at 15. which sounds a lot worse now than it actually was back in 1974. I was the youngest of 5 and my older siblings were all married & settled so I actually did have all the love I needed from them.. in fact I ended up with 5 mothers instead of 3 sisters and 2 aunts. But leaving school after the Inter cert (as the Junior Cert was called then) meant that I did have to struggle financially in fairly low paid jobs until I went back and did my leaving at 20 and then went to college at night. I can remember the first time I had a glimmering of the direction God was calling me. We had just come back from living for 8 years in Utrecht Holland (where both of my children were born) and we were living in Greystones and like most people from Wicklow 4 as it’s often called, I was commuting into Dublin City for work. Anyway , one morning, as I sat on the express bus listening to Morning Ireland with my headphones, I heard a young social worker speak of how the only thing she could do for the homeless teens in her care was buy them fish & chips and bring them to the Garda Station out of the rain. Something in this story stopped me in my tracks and made me feel that my life needed to change, I absolutely had to try and somehow help those on the margins. I probably understood on some level that that could have been me without the love of a family. I had no idea then what way and certainly hadn’t discerned a vocation to the priesthood at that point. I got in touch with the Homeless Charity Focus Ireland and asked how I could help. When they heard what I worked at, they asked me to come and help with their IT. In the end, for a couple of years I used to spend half of my lunch hours keying in data in their Eustace Street offices…. It wasn’t much but I felt that I was doing something. The year I was about to head into the Theological College, I had a choice of a contract in Portugal or less exotically, the Isle of Man… As I knew I was going to be leaving my family from Monday to Friday for the next three years I decided to rely on our savings and take some time off before I had to begin in the college, so I didn’t work from April until September that year. I’d worked all my life so I thought that this was an opportunity to give some real time to others. I volunteered to work a couple of days each week with Focus, thinking I’d be helping in the kitchen or on soup runs or something real…. but again, I was asked to use the existing skills I had. So I ended up , 9 to 5, teaching people in the head office how to use Microsoft Office programs. From teaching the then CEO how to use Powerpoint for his presentations to showing the girls working in the Creche how to use Word. It was great fun as you can imagine and I learned a huge amount too. When you say to someone ‘hit the left click on the mouse’ and they say ‘what’s the mouse’ you know you need to revise your training approach! My point in telling you all this is that , in my ignorance, I thought that I should be out in the streets, making what I thought was a real difference to the homeless and wounded, but in fact, Sr Stanilaus and her team, knew that the best thing you can offer is what you can already give…. the ministry of presence…. I loved my few months with them and I do know that I made a difference to the people who were helping the people most in need. I have come to appreciate that all we can do is offer of ourselves, as we are, in whatever situation we find ourselves. Like that Social Worker who wanted to save the teens from the streets but who ended up just buying them fish & chips and one night out of the rain, we can only do so much. … We are limited in what we can do but that shouldn’t stop us from doing anything. In my current position, while I love to feel that I am actively changing the world bit by bit but I am also aware that sometimes the best that I can offer, in that moment, is to just be there for others. Listening to someone who is in crisis. Sitting with a grieving family in a hospice. Celebrating happy life events, always joyful that people want to celebrate them within a faith community. or just simply helping someone realise for themselves that they have potential, that they are beloved children of God. But there are also the external active things I can now do in my position …. Helping break down barriers between our Christian Denominations, armed with a Masters in Ecumenics! Myself and my [Roman Catholic] counterparts in both Carrigaline and Monkstown, Frs Pat & Sean & Con try and do as much as we can together….. from joint Community Carol Services to Services of Remembrance in the Golf Club, From Services in School to Dawn Services at Easter.. If we can do something liturgical together we do, and we also socialise together which is important too! Organising and promoting events to highlight injustices in the world.- a couple of weeks ago, Senator Frances Black held an open meeting in my Parish Hall, it was packed out on the night as she talked about her upcoming Bill on Illegal Territories, highlighting how to lobby our local politicians. Enabling people to see the humanity of others outside of their own ethnicity and faith so that they can , in solidarity, support each other. Being part of the 3 Faith Forum , which is a group for all three Abrahamic Faiths to work together for understanding, really helps as we attend each others festivals , like Iftar at the end of Ramadan, or the lighting of the last light of Hannukah in Shalom Park in Cork. All helping to break misunderstandings and tensions. Encouraging children and young people to have a voice in their community, allowing them to realise that they can make a real difference. Like getting the children involved in ecofriendly activities, or animal welfare issues… the children in my parish school drew wonderful paintings of rabbits which were sent, via Compassion in World Farming, to each and every MEP in the European Parliament, to remind them of what they would have felt about rabbits when they were small children and how it is never right to cage rabbits…. That particular Bill was defeated – I like to think by the many children’s drawings and paintings sent into Strasburg…. Helping people to see their role in environmental or social justice issues like Fairtrade. Showing people the power that is in their own purses! Enabling the older in our community to get together regularly socially so as not to lose sight of who they are, helping them to fight the casual agism that is rampant in our society. Or even on a personal front, being brave enough to speak my own opinions and not to hide behind the collar as is always the temptation – remembering that God called me as I am , not some whitewashed version of myself. It is such a personally satisfying position that I am now in, with the opportunity to perhaps help corral other people’s concern and kindness into practical ways of helping. I think back sometimes to that bus journey 20 years ago, the 84X from Greystones to Dublin, listening to that unnamed social worker , doing her best by treating those homeless boys to a hot meal of fish & chips and I thank God for her words spoken that day. I also thank God that I have been blessed with this life that affords me the opportunity to live as a radical disciple in this wounded world a life that also allows me to be present for others helping them fulfil their potential becoming in turn radical disciples ready and able to bring healing to others…. and the healing goes on and on…. Thank you for listening today to one personal perspective.